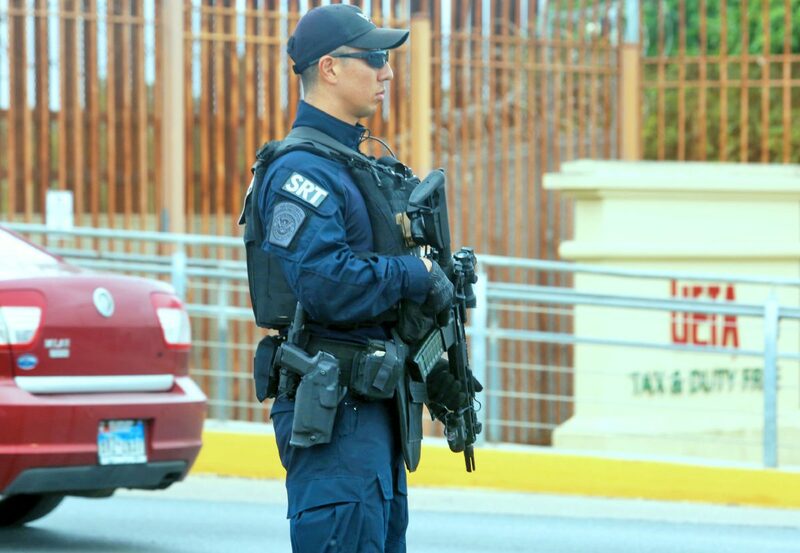 A Customs Border Protection Special Response Team member patrols at the Hidalgo-Reynosa International Bridge on Friday, Nov. 9, 2018, in Hidalgo. HIDALGO — On the same day President Trump used national security powers to deny asylum to migrants who enter the country illegally, U.S. Customs and Border Protection and Department of Defense officials held a briefing Friday on border support operations. 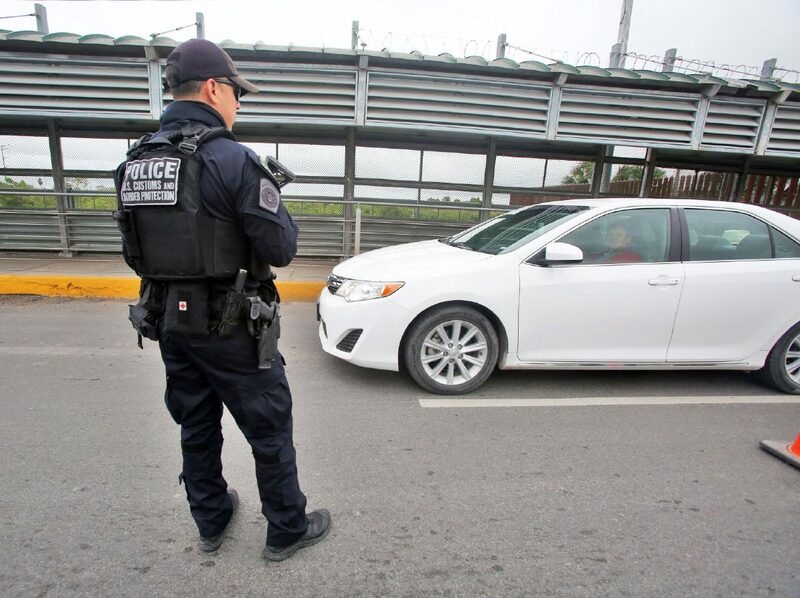 CBP and DOD officials invited members of the media for a tour of the Hidalgo-Reynosa International Bridge and discussed Operation Secure Line amid the furor over a migrant caravan making its way to the U.S.-Mexico border. Giving prepared statements and taking questions from media were David P. Higgerson, CBP director of field operations for the Laredo field office; U.S. Border Patrol Deputy Chief Raul Ortiz, of the Rio Grande Valley sector; Donald J. Sperling, director of Air and Marine Operations, McAllen Air and Marine Branch; and Col. Richard Ball, 89th MP Brigade commander, Task Force Griffin. The tour of the bridge comes nearly two weeks after CBP Commissioner Kevin McAleenan and Air Force Gen. Terrence J. O’Shaughnessy announced the deployment of 7,000 active-military troops to help “harden” the southwest border. This was in anticipation of a caravan of migrants seeking asylum from Central America, making their way through Mexico to the U.S. southwest border. 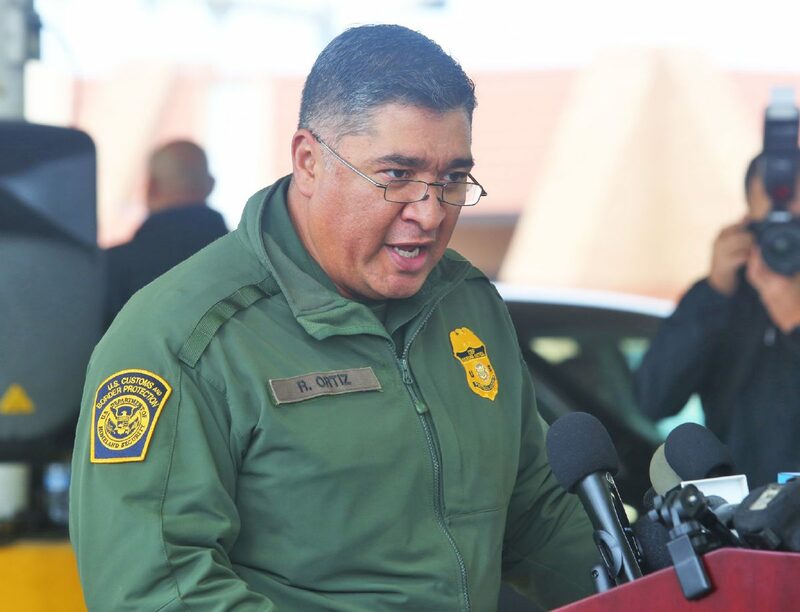 Raul Ortiz, U.S. Border Patrol acting chief patrol agent for the Rio Grande Valley Sector read a statement during a U.S. Customs and Border Protection press conference at the Hidalgo-Reynosa International Bridge on Friday, Nov. 9, 2018, in Hidalgo. 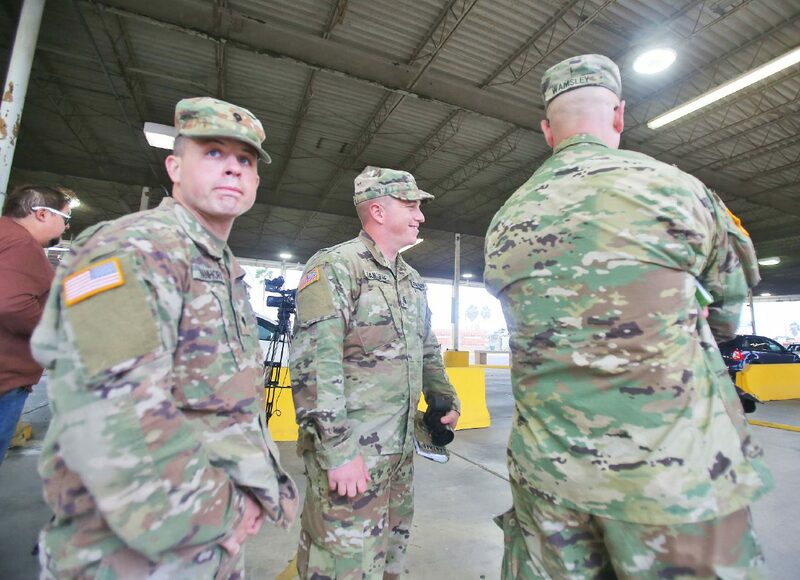 U.S. Army soldiers attend a U.S. Customs and Border Protection press conference at the Hidalgo-Reynosa International Bridge on Friday, Nov. 9, 2018, in Hidalgo. Higgerson made it clear that this particular bridge, while a high-traffic port of entry, does not have the infrastructure needed to effectively process large groups of asylum seekers, stating that they can process only about 49 people a day with space to hold about 19 people in their facilities. Higgerson also made a point that they will treat all migrants with dignity but will not allow any group to make forced entry into the country. “We will not tolerate and will not put up with any forcible type of entry into the United States, that we will do whatever is necessary to control our borders,” Higgerson said. President Trump has previously said he could send up to as many as 15,000 active-military troops to the southwest border. McAleenan said the military troops, who would be armed but not allowed to conduct law enforcement duties, would be acting in support of CBP, U.S. Border Patrol and the more than 2,000 National Guard troops who were sent to the border in April when the administration said a “spike” in illegal entries the month before necessitated the deployment. This recent deployment of active-military troops came after President Trump’s characterization that the caravan of migrants was an “invasion,” coming from Central America. Originally named “Operation Faithful Patriot,” Pentagon officials said they changed the mission’s name to “Border support operations,” the day after the midterm elections because it “more accurately” described the recent deployment. 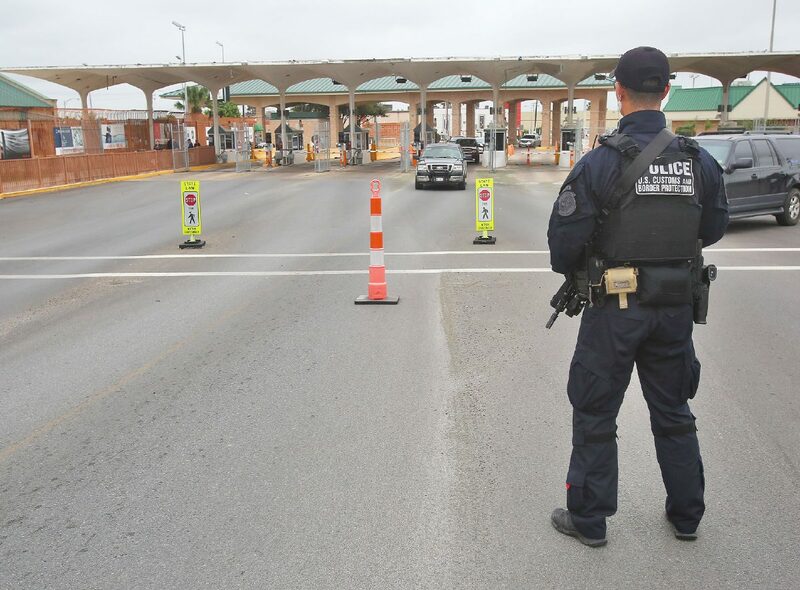 After the announcement on Oct. 29, preparatory operations began at several ports of entry and bridges along the U.S. southwest, including in Brownsville, McAllen, Laredo, El Paso and Nogales, where CBP, Border Patrol, and military personnel could be seen conducting crowd control exercises while wearing riot gear, and putting up concertina wire in anticipation of the caravan arriving at the respective ports. Last week at the Progreso-Nuevo Progreso International Bridge, contractors installed a pedestrian gate and a vehicle gate on the U.S. side of the bridge as a preventive measure in response to the caravan. McAllen city officials on Wednesday released a prepared statement addressing the caravan, amid concerns a large contingency would disrupt the bridges and ports along the U.S.-Mexico border. On Thursday, a revised list of deployed units along the southwest border was released in a memo from the office of Assistant Secretary of Defense — showing that a total of 2,800 troops would be deployed in Texas, 1,500 troops in Arizona, and 1,265 in California. According to officials on the tour, of the 2,800 troops deployed in Texas, 1,000 are in the Valley. The caravan began its trek with about 5,000 migrants in mid-October, and most recently stopped in Mexico City and rested Wednesday and Thursday. Late Thursday night the group had voted to continue its journey to the U.S.-Mexico border, specifically to Tijuana — a longer but safer route, representatives with the caravan told media outlets late Thursday night. In April, a caravan of more than 1,500 migrants traveled through Mexico, but that group dwindled down to about only 200 people who also opted to go to Tijuana as opposed to the Texas border, which is considered a shorter but more dangerous route. Ortiz said there are already more than 800 Border Patrol agents in the San Diego and Tucson sectors acting in support of the “hardening” of the southwest border, and would be sent west if the movement of the caravan called for as much. Higgerson said a decision to redeploy troops was not something under review because it is unclear where the caravan will ultimately arrive. If such action was necessary, however, they would be prepared to act. The day after U.S. Attorney General Jeff Sessions was forced to resign, his former chief of staff Matthew Whitaker and Department of Homeland Security Secretary Kirstjen Nielsen announced the proposed change. The release goes on to state that the current asylum system is burdened by meritless asylum claims. U.S. law currently does not exclude people who come into the country illegally from asking for asylum. Trump, in making the decision regarding migrant asylum seekers, utilized the same powers used when he pushed through a version of the travel ban on people from Muslim countries — that was subsequently upheld by the Supreme Court. As expected, the American Civil Liberties Union, along with the Southern Poverty Law Center, and Center for Constitutional Rights filed a federal lawsuit Friday against the Trump administration — challenging the asylum ban proclamation. U.S. Rep. Filemon Vela, D-Brownsville, reacted to the Trump administration announcement that applicants attempting to declare asylum would be forcibly removed, saying this was another attempt at blocking a legal process. ”In a continuation of policies we observed for months, the president and U.S. officials are declaring that those fleeing violence in their home countries can only seek relief by presenting themselves at U.S. ports of entry, and then they promptly move to block the ports of entry. Like every other issue, the key is to watch what the Trump administration does — not what they say,” Vela said.